Korea is the growth pacesetter for U.S. pork in 2018, with exports up 44% from a year ago in volume (148,233 mt) and 50% in value $424.3 million. July exports of U.S. pork and beef were higher than a year ago, according to data released by USDA and compiled by the U.S. Meat Export Federation. Export value results were mixed, with beef exports posting another near-record month while pork export value declined, reflecting the impact of retaliatory duties imposed by Mexico and China. Pork exports totaled 176,413 metric tons in July, up 1.5% from a year ago, valued at $465.3 million — down 5% year-over-year and the lowest monthly value since February 2016. For the first seven months of the year, pork exports remained 2% ahead of last year’s record volume pace at 1.45 million mt, while value was up 3% to $3.83 billion. July exports accounted for 24.7% of total pork production and 21.7% for muscle cuts only, down from 25.9% and 21.3%, respectively, last year. For January through July, the percentage of total pork production exported fell from 27.5 to 27%, but for muscle cuts the percentage increased from 22.8 to 23.3%. July pork export value averaged $48.49 per head slaughtered, down 11% from a year ago. Through July, per-head export value was up slightly to $54.27. Led by another spectacular performance in South Korea and strong growth in Japan, Taiwan and Latin America, July beef exports climbed 12% in volume to 116,575 mt, valued at $722 million — up 16% from a year ago and just slightly below the May 2018 record of $722.1 million. For January through July, beef exports established a record pace in both volume (779,450 mt, up 10% year-over-year) and value ($4.76 billion, up 20%). July exports accounted for 14% of total beef production and 11.8% for muscle cuts only (the highest since December 2016) — each up nearly a full percentage point from a year ago. For January through July, exports accounted for 13.5% of total beef production and 11.1% for muscle cuts — up from 12.8% and 10.1%, respectively, last year. Beef export value averaged $326.18 per head of fed slaughter in July, up 9% from a year ago. Through July, per-head export value was up 16% to $318.31. The duty rate on most U.S. pork entering Mexico increased from zero to 10% in early June and from 10 to 20% in early July. This took a toll on July exports to Mexico, especially in terms of value. July volume was 56,484 mt, down just 4% from a year ago. But pork moved south at lower prices, with value falling 25% to $92 million. In China, the duty rate on U.S. pork and pork variety meat increased from 12% to 37% on April 1, and to 62% on July 6. July exports to the China/Hong Kong region totaled 22,199 mt, down 31% from a year ago, while value dropped 19% to $55.9 million. Pork variety meat volume to China was hit especially hard in July, dropping 49% from a year ago to 7,446 mt. 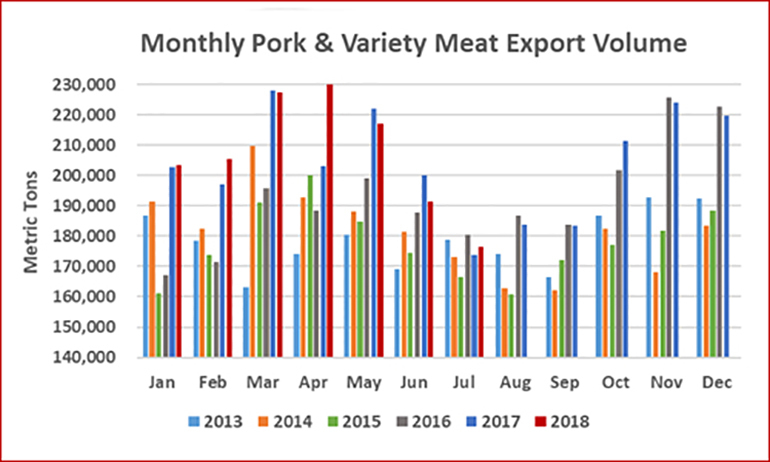 For January through July, pork and pork variety exports to China/Hong Kong dropped 22% year-over-year in volume (238,207 mt) and 10% in value ($563 million) — due in part to the higher duty rates, but also due to an upward trend in China’s domestic pork production. The July export picture was much brighter in other major markets — including Japan, the leading value destination for U.S. pork. Exports to Japan totaled 31,248 mt in July, up 10% from a year ago, while value climbed 6% to $127.2 million. For January through July, exports to Japan were 1% ahead of last year’s pace in volume (230,315 mt) and 2% higher in value ($948.6 million). This included a 2% decline in chilled pork exports to 120,288 mt, though chilled pork value increased 1% to $580.4 million. • Korea is the growth pacesetter for U.S. pork in 2018, with exports up 44% from a year ago in volume (148,233 mt) and 50% in value $424.3 million. The United States has supplied 40% of Korea’s imported chilled/frozen pork this year, up from 36% in 2017. U.S. pork dominates Korea’s imports of picnics and butts while Europe supplies most of the bellies. But Korea is also importing more of a wider range of U.S. pork cuts, including loins, hams and ribs. • Fueled by strong results in Colombia and Peru, pork exports to South America increased 30% in volume (73,003 mt) and 26% in value ($180.3 million). Although year-to-date pork exports to Chile were down 7%, exports gained momentum in July and were the second largest on record at 4,103 mt. U.S. pork also recently gained access to Argentina, which could further boost exports later in the year. • Double-digit growth in all seven Central American nations pushed pork exports to the region 19% above last year’s pace in volume (46,020 mt) and 18% higher in value ($108.9 million). Honduras and Guatemala are the leading destinations, but U.S. pork continues to gain momentum throughout Central America. • The Dominican Republic has also been a top growth market this year, with exports up 22% in volume to 25,985 mt and value up 19% to $56.7 million. This included a 79% increase in July volume (3,718 mt), with July value up 42% to $7.2 million. • In Oceania, a critically important market for U.S. hams used for further processing, exports climbed 7% in volume (49,649 mt) and 9% in value ($145.7 million), with exports trending higher to both Australia and New Zealand. • With strong growth to the Philippines and shipments to Vietnam more than tripling from a year ago, exports to the ASEAN region climbed 23% higher in volume (32,888 mt) and 25% higher in value ($85.9 million). U.S. beef exports to Japan hit a post-bovine spongiform encephalopathy volume high in July, reaching 31,883 mt (up 15% from a year ago) valued at $196.3 million (up 12%). For January through July, exports were up 7% in volume (191,237 mt) and 12% in value ($1.21 billion). This included a 4% increase in chilled beef exports to 87,034 mt valued at $694.9 million (up 13%). U.S. beef has captured 50% of Japan’s chilled import market this year, down slightly from a year ago. Beef export growth to Korea continued at a remarkable pace in July, with volume up 51% from a year ago to 23,614 mt and value soaring 66% to $169.2 million. This shattered the previous monthly value record of $154.8 million, set in June 2018. For January through July, exports to Korea jumped 38% to 136,897 mt, valued at $971.2 million (up 54%). This included a 33% increase in chilled beef exports to 29,923 mt, valued at $289.2 million (up 45%). U.S. beef has accounted for 58% of Korea’s chilled beef imports this year and 53% of the chilled/frozen total (up from 54% and 47%, respectively, during the same period last year). Australia is expected to trigger its beef safeguard in the coming weeks, resulting in a temporary tariff rate increase agreed to in the Korea-Australia Free Trade Agreement. This could further strengthen momentum for U.S. chilled beef to Korea through the end of this year. • Although export volume to China/Hong Kong slowed in July, the January-July total was still up 10% from a year ago to 72,193 mt, while value climbed 37% to $572.9 million. Efforts to build a presence for U.S. beef in China have been hampered by retaliatory duties, which increased the tariff rate from 12 to 37% in early July. January-July exports to China were 4,138 mt valued at $36.4 million. • U.S. beef is enormously popular in Taiwan, where the United States captures nearly 75% of the chilled beef market. July export volume was record-large at 5,640 mt, up 46% from a year ago, while value climbed 32% to $48 million. Through July, exports to Taiwan increased 34% from a year ago in volume (32,504 mt) and 38% in value ($297.7 million). Chilled beef exports totaled 13,040 mt (up 32%) valued at $161.3 million (up 41%). • Despite recent trade tensions and uncertainty, beef exports to Mexico have been very solid in 2018, with volume up 2% from a year ago to 137,560 mt and value up 9% to $596.5 million. For muscle cuts only, exports increased 10% in volume to 80,450 mt and 11% in value to $465.7 million. • Strong growth in the Philippines helped push beef exports to the ASEAN region 9% higher in volume (25,520 mt) and 24% higher in value ($141.6 million). Exports to Singapore and Indonesia have also increased this year, though volumes to Indonesia slowed the past two months. • In Central America, larger volumes to Costa Rica, Guatemala and Panama pushed exports 29% higher in volume (8,320 mt) and 28% higher in value ($45.4 million). Despite a modest decline in volume, export value also increased to Honduras.